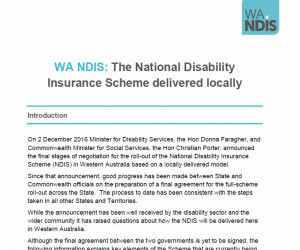 On 2 December 2016 Minister for Disability Services, the Hon Donna Faragher, and Commonwealth Minister for Social Services, the Hon Christian Porter, announced the final stages of negotiation for the roll-out of the National Disability Insurance Scheme (NDIS) in Western Australia based on a locally delivered model. Since that announcement, good progress has been made between State and Commonwealth officials on the preparation of a final agreement for the full-scheme roll-out across the State. The process to date has been consistent with the steps taken in all other States and Territories. While the announcement has been well received by the disability sector and the wider community it has raised questions about how the NDIS will be delivered here in Western Australia. Although the final agreement between the two governments is yet to be signed, the following information explains key elements of the Scheme that are currently being finalised.